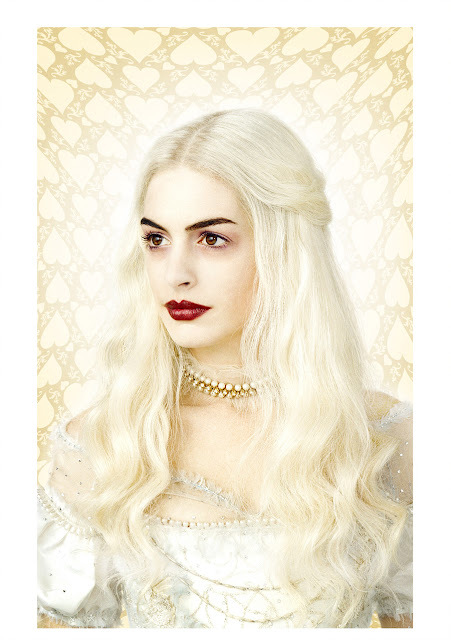 Mirana, the White Queen, is the younger sister of the Red Queen (Helena Bonham-Carter), and while she appears to be all sweetness and light, beneath the surface there’s a hint of darkness to her character. “She comes from the same gene pool as the Red Queen,” says Hathaway. “She really likes the dark side, but she’s so scared of going too far into it that she’s made everything appear very light and happy. But she’s living in that place out of fear that she won’t be able to control herself.” When Alice returns to Underland, the White Queen takes her under her wing, offering her protection, although her motives aren’t completely altruistic. 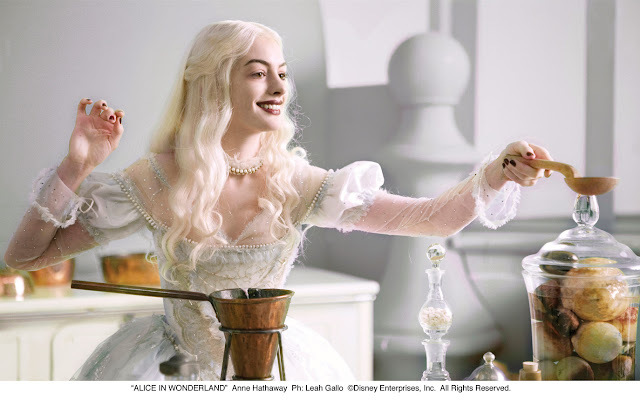 Anne Hathaway: This is “Alice in Wonderland” 10 years later. The story isn’t the same. And in re-reading the book in preparation for the film, I noticed that a lot of it is Alice trying to figure out who she isn’t by process of elimination. She knows that she isn’t all the things that people are saying that she is, and so, by going through all of them, she gets a better idea of what she is. And in the Tim Burton “Alice in Wonderland,” Alice is trying to name who she is without using the process of elimination in a similar way. There’s a great line in it, where someone says, “You seem like Alice, but you’ve lost your muchness.” That’s my favorite line. So I think if the book is about Alice exploring her imagination, this one is about Alice finding her soul. Q: Why are Carroll’s characters great for a Tim Burton movie? Anne: One of the reasons why “Alice in Wonderland” and Tim are such a great match is because nothing is exactly as it seems in Wonderland. Nothing is entirely good or entirely bad. There’s a mixture of life and texture and intention, and I think that’s something with which Tim is really comfortable. And if you look throughout his filmography, nothing is ever what it appears to be or should be. So, I think in that sense, living in the questions, the ambiguity, but also the specificity of the world—these are things in which Tim excels as filmmaker. I believe the filmmaker and the subject matter complement each other really beautifully in this film. Anne: I play the White Queen. When I was trying to work her out, I kept saying to myself, ‘She is a punk-rock, vegan pacifist.’ So I listened to a lot of Blondie, I watched a lot of Greta Garbo movies, and I looked at a lot of the artwork of Dan Flavin. Then a little bit of Norma Desmond got thrown in there, too. And she just kind of emerged. And I really like her. When I first came onboard the project, Tim talked a lot about the relationship between the sisters, and that really opened the character up to me a lot. Anne: I’m just going to be a gushy fan for a second. I love Tim Burton—he’s one of my all-time favorite filmmakers. For as long as he’s been making films, I’ve been going to them opening weekend. And I watch them again and again on DVD. I love his aesthetic. I love his ability to pace as a filmmaker, his comfort with things that are kind of odd—he also finds a way to ground them. I think it’s very unusual to find a filmmaker who isn’t trying to be different for the sake of being different, to show you something you’ve never seen, but is actually yearning to stretch the limits of his imagination. So everything Tim does comes from a very pure place. And I think that’s why his movies, in spite of the sometimes off-beat subject matter, have such heart. I love that. Anne: The White Queen has had her crown taken from her, and she’s basically powerless to stop her sister’s reign of tyranny. Her sister is the Red Queen. And so, she is waiting. She’s basically taken a vow of non-violence that she cannot break, and she’s waiting for her champion to arrive to help her reclaim her throne—the citizens of Underland would like to see that happen. They want to see her restored to power, because she’s kind. Anne: The actor who plays the Mad Hatter, Johnny Depp—I have so much fun watching him in all of his movies as an audience member, so to actually get to watch him perform live is such a treat. He’s so inventive—and he’s kind, just a very kind, warm man. But to actually watch him in his element, in his zone, just acting, it’s a thrill. I want him to do theater so that everyone else can get in on it. He’s very powerful. I just felt very privileged to get to watch him. Q: What does Mia Wasikowska bring to her Alice character? Anne: Mia Wasikowska is an absolute delight of a young woman. She’s so playful and natural and down-to-earth—but she also has this ethereal quality to her, she feels timeless. What she brings to Alice is very, very difficult to pull off. Every time I do a scene with her, I’m just amazed at what she’s doing with it and that a young actress can bring so much gravity to this world. It’s somewhat eerie, the way she’s able to communicate feeling and where Alice is at that moment. It was lovely to work with her, just to get to observe that. Anne: Because the world of this film begins and ends in the imagination of Tim Burton, you’re not seeing a movie that’s been shot on locations that you’ve seen a million times. Because this world has no rules, you’re seeing so many different and separate brushstrokes and colors and characterizations somehow getting combined through Tim. And what I think you’re getting is an absolute exploration of the imagination. I think that’s the essence of the book, and I think that’s the spirit Tim’s brought to the film. Everybody on the film was so clever, so creative, so imaginative—and I think that’s what the film is about—how can we tell a story that honors the imagination in the most imaginative way humanly possible? And that’s such a fantastic idea.